Note – This article is the fifth of a five part series by Photographer Dominic Urbano on vacationing and photography on Kauai. Kauai Day 5 – The beauty of the Alakai swamp is not as readily apparent as other sights on Kauai. Part of this is because the Alakai swamp trail begins at the Kalalau Valley lookout. The hiker has to make an adjustment from trying to take in the vast view of the Kalalau Valley’s rapid drop to the Napali coast 4000’ below, to the subtle beauty of much more immediate surroundings. Fine art landscape prints of Kauai are available. It was a struggle for the first mile or so of the Alaki swamp trail to make this adjustment and I began to feel that maybe choosing this hike was going to be a mistake on our short trip to Kauai. But then my focus began to change. The beauty of the flora began to come into focus and I started to see why the Alakai swamp trail is so highly recommended. A multitude of mosses, lichen, flowers, and shrubs surrounded us with muted color as mist rolled across the landscape in an almost mystical fashion. No, this was not the same as standing at the lip of the Kalalau Valley, or in the face of the massive waves of Secret beach. This was subtle. This was different. The Alakai swamp is another place on Kauai that clearly illustrated the great variety of landscapes that the island has to offer. At an elevation of over 4000’ feet the Alakai swamp trail is well above where tropical ends and temperate begins. There is no jungle at this elevation. Here you will see low shrubs, trees, mosses, ferns, and the occasional bright flower. 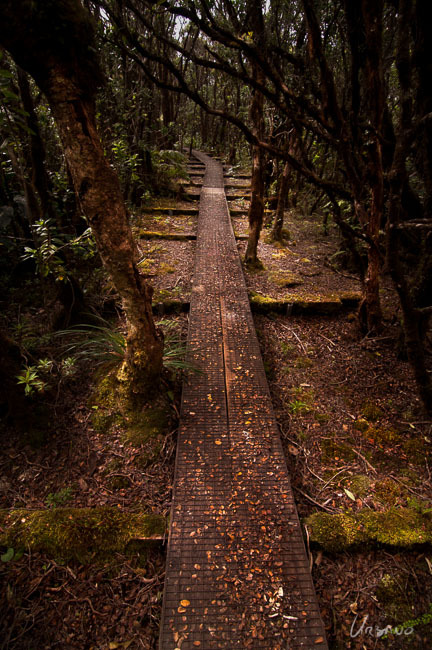 The trail is primarily a wooden boardwalk that keeps the hiker elevated a few inches above the soft bog. The visual impact of miles of wooden boardwalk winding off into the distance cannot be overstated. Where the boardwalk meets steep sections of terrain it is converted into steps. The human effort to build this must have been significant. The end reward for the four mile trek to the end of the trail is reportedly a tremendous view out over the Taro fields of northern Kauai. I have to take it on faith that this is true. Upon our arrival at the trail’s end a wall of white mist greeted us. We enjoyed our lunch on the bench at the viewpoint and waited for the mist to clear. It never did. Dominic Urbano is a professional photographer based in Leavenworth Washington. Copyright - Dominic Urbano. All rights reserved.